Indian Amateur Radio Satellite Programme . AMSAT is a worldwide group of Amateur Radio Opertators who share an active interest in building, launching and then communication with each other through non-commercial Amateur Radio satellites. First signals by r4uab over Russia. R4UAB reported the successful RX of your beacon. AISAT launch on April 1, 2019: World’s first innovation to reduce space debris and use rockets more efficiently. With the increasing number of satellite launches, there is a need to reduce space debri and to use rocket launch vehicles more efficiently. ISRO, the Indian Space Research Organisation, has collaborated with AMSAT INDIA, an organization for the Indian amateur radio satellite programme, which in turn has collaborated with Exseed Space, India’s leading private satellite manufacturer, to create a world-first innovation. ISRO’s PSLV is a proven satellite launch vehicle with four stages. While the first three stages are jettisoned and return to earth, the fourth stage reaches the orbit of 500 km or more and releases its payloads. After the payloads are released, this fourth stage typically becomes space debris, orbiting the earth for a long time till it eventually burns up on re-entry. 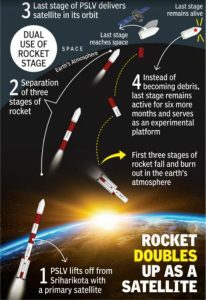 ISRO came up with the idea to use this fourth stage as an orbiting platform itself with payloads attached directly to it. 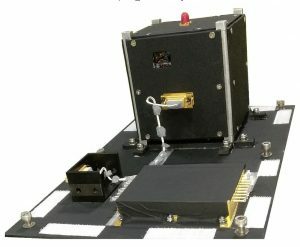 In December 2018, ISRO asked AMSAT INDIA to provide an amateur radio payload which would be the first experimental payload in the world to use the fourth stage platform. AMSAT INDIA in turn contracted Exseed Space to design and build this payload. The resulting satellite: AISAT will be launched at 09:27 IST (03:57 hours UTC) on Monday, April 1 from Sriharikota, India, on PSLV C45. • So far, all satellites built have solar panels, power sources and antenna of their own. AISAT, in a world-first, has none of the above systems. • The satellite uses a shared source of power provided from solar panels on the fourth stage platform and an antenna system provided on the platform by ISRO. This approach makes the payload smaller, lighter and much less expensive to develop a payload. • As a result of this simplification, AISAT was built from start to finish in a record time of six working days by Exseed Space. Typically, satellites take many months to build this innovation radically brings down the time and cost. • Typically, over half the mass and half the volume of a satellite is taken up by the solar panels and antenna systems. This innovation reduces the need for both by over 50% – and thus brings down satellite build cost dramatically. This innovation would make space launches among the most affordable in the world. 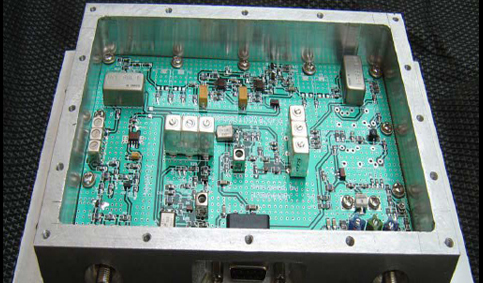 This experimental radio payload on the fourth stage platform is an Automatic Packet Reporting System (APRS) – also called a digipeater. APRS is an amateur radio based system for real-time digital communications using a 1200 baud data rate. APRS data are typically transmitted on a single frequency and repeated locally by area relay stations for widespread dissemination on earth. In addition, all such data are typically sourced into the APRS Internet System via amateur radio satellite gateway stations located all over the world and distributed globally for ubiquitous and immediate access. 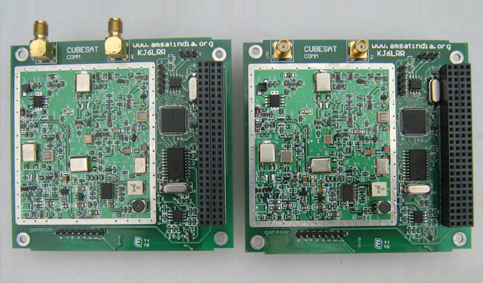 APRS digipeater payloads in space, like the one to be launched on April 1, work like terrestrial APRS digipeaters, but with a much larger global footprint. The frequency used by this payload will be 145.825 MHz in line with other Amateur Radio 1200 bps APRS satellites and the path is via AISAT and also via ARISS (Amateur Radio on International Space Station). The APRS payload will be powered on at 12:29 IST or 06:59 UTC on April 1, 2019 approximately over 70N Lon and 65E Lat (around Sweden, Norway, Denmark, Finland, Poland, Moscow). AMSAT INDIA and Exseed Space welcome the amateur radio fraternity around these countries to report the first signals and to make full use of the payload. We also request Radio Hams worldwide to use this payload actively and for satellite gateways to feed APRS traffic. AMSAT INDIA and Exseed Space entered into an agreement where Exseed Space designed and manufactured the payload. The payload was realized in record time – just 6 working days – by the Exseed Space team headed by Ashhar Farhan, VU2ESE. 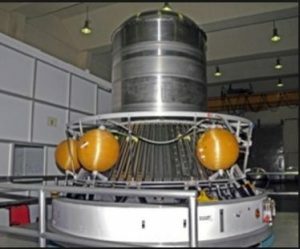 The payload was extensively tested at URSC-ISRO to undergo thermo-vac, environmental, vibration and EMI/EMC tests. Prior to the above tests improvements at various stages were done at URSC-ISRO to qualify the payload for flight worthiness. These tests and improvements were completed successfully under the guidance of M.R. Raghavendra VU3GTI and B.A.Subramani VU2WMY, who were deputed by ISRO as nodal contacts to work with AMSAT INDIA on this project. AMSAT INDIA and Exseed Space would like to thank SIPO-ISRO HQ and URSC-ISRO for all the support and encouragement extended in realizing this record-setting project. Be a part of the action and excitement of designing, building and working through the amateur radio satellites. HFI 2018 will be held in Bangalore on December 29th and 30th 2018. AI will be setting an exhibition area related to Amateur Radio satellites. Visit www.hamfestindia2018.com for more information.